The St. Patrick’s lunch at Points West Living Peace River was a fun affair, with residents happily donning green hats and beads to go along with the green-themed decorations. But the surprise visit of a little person decked all in pink was the highlight of the party. 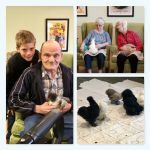 The Easter Bunny paid a sweet visit to residents of Points West Living Stettler on April 16. Everyone got a chance to hug or shake paws, and receive a chocolate egg. Inevitably, when the Easter Bunny appeared around a corner, residents and employee care partners would give a look of surprise, then a big smile, followed by laughter.